Good morning, party people! Today is a fun day...it's time for the Unity Inspirational Blog Hop! I'm not supposed to be chatty, so here's my card...I am in love with it, and it took 15 minutes (GO ME!). Whatchathink? "Those who hear not the music, think the dancers mad." If you've just happened upon the blog hop, you can click HERE to start at the beginning. Next stop on your way: Shemaine @ Scraptastic! Great card, I love the colors and your layout. Shannon this card is gorgeous! :) I am in love with the colors! You card is gorgeous, Shannan!! I love the colors, edging, and of course that fab image!! love great simple yet beautiful cards!!! What a great card! I have this stamp and haven't used it yet...you've given me inspiration. Great card - and only 15 minutes, huh? I wish they were all that fast! Love how you outlined the path in white. Beautiful card! Of course YOU can make something so simple still be incredible!!!! Fantastic! I always have such difficulty doing a sentiment based card; this is gorgeous! Love how simple but stunning it is! go you!!! love your card!!! What a beautiful card! Can't wait to get this stamp! I love this quote and stamp too. You did a great job keeping your card simple and focusing on the stamp. I love it! Morning Shannan!!!! Gorgeous Card chicka!!!! Beautiful card! Guess what - I posted a card yesterday with the same quote! How fun is that! So very BEAUTIFUL -- LOVE that sentiment!!! Great job! You have a great blog! I am finding some real gems on the blog hop. I love the ribbon treatment on your project. The card is beautiful. It may have taken you only 10 minutes, but it would've taken me an hour! it's awesome. Love the card and the stamp you used on the card! Love the quote....gus from Unity says hi. Love the card so simple and beautiful! Love your card, its so simple and pure! I love the clean and accurate look of all the cards I've seen you do. You have a great eye for design (IMHO). I love the white on the path, I think that made the card! Love your card - every little touch is perfect! Love the colors Shannan, it's simply perfect! that was a 15 minute card? GO YOU!!!!! Love it! That border punch is fabulous! Oh Shannah, I love how you did a white outline on the road. This is super gorgeous! Terrific card! Love the colors! 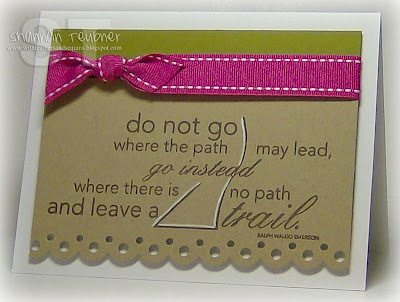 I love the border punch and the the ribbon - FABulous! Yay you!! Your card is just gorgeous!! Oh I'm in love with it too!! Simple elegance!! Hooray for YOU! Cute Card. WOW! 15 minutes. YOU ARE THE EMPIRESS of stamping. :) Thanks for JOINING THE BLOG HOP! Very pretty card! Love your quotes. Simple but SWEET, love it! WOW Stunning! The white is the Perfect touch! FAbulous card, Shannan! LOVE your quote about the dancer too! What a fun card Shannan!! The colors are so FRESH! Love it! Simple, clean, elegant! Love how clean and simple it is and I LOVE the white on the path! Sweet card Shannan. LOVE the simplicity of your layout. Great simple card. Love that you made the quote the center focus...great stamp isn;t it??????? i like your quick card! Doncha just love cards like this? Not only is it FABBY, but it was super quick! Go YOU! I love the way you used the white gel pen for the little shadow! Great card! Love that sentiment stamp! great splash of color with the ribbon! Great CAS card! I love the pop with the pink ribbon! Shannan! I'm so lucky to be right before you on the blog hop! You are amazingly talented! I love love love the colors you used and the gel pen! This is the most fabulous 15 min card EVA! This is absolutely gorgeous Shannan!! Yes, you go Shannon!!! Super cute! 9.. i love the first quote. great card as well! you always have great cards! Love your card! Awesome colors and design! This is a great card. This give me such a great idea for a card. Such a beautiful card, I LOVE the quote! Lovely! So clean and elegant! I love the pink and green with kraft combo!! Love this clean, classy look, Shannan! this card is so sweet! Love it!!! This is simply DIVINE, Shannon!!! Wonderful colors, and the white gel pen really adds some POP! Fabulous job, girl! The colors are fabulous! And I love the use of the white gel pen! Beautiful card and 15..you can't go wrong! Go YOU!!! Great card, Shannon. Love the white accent and scalloping. FABulous!!!!! Into the memory banks! Oh! LOVE LOVE LOVE this!!! Especially when it turns out like THAT!! Great colours...love the punched border. Thanks for taking time to leave me a note! All images and artwork ©2016 Shannan Teubner. This blog is for inspiration only. Please do not copy or use these photographs or designs for contest submission, publication, or other personal gain. Please do not harvest or hotlink to images/content without my prior consent. Thank you!